[BBC] The ruler of Dubai, Sheikh Mohammed bin Rashid al-Maktoum, says he is giving $10bn (£5bn) to set up an educational foundation in the Middle East. Sheikh Mohammed, known as a successful racehorse owner as well as ruler of Dubai, said his personal initiative was aimed at creating what he called “a knowledge-based society” in the Middle East. At the moment, he explained, there was high illiteracy in the region – where more than 40% of Arab women cannot read or write. “There is a wide knowledge gap between us and the developed world in the West and in Asia. Our only choice is to bridge this gap as quickly as possible, because our age is defined by knowledge,” the sheikh said. “Our region needs at this moment 15 million job opportunities, and our Arab world will need in the next 20 years between 74 to 85 million job opportunities,” the sheikh told the conference. “In order to realise these objectives, I have decided to establish the Mohammed bin Rashid al-Maktoum Foundation to focus on human development, and have I decided to endow a fund of $10bn to finance its projects,” he said. [Via AP] Attorney General Alberto Gonzales says his long friendship with President Bush makes it easier to say “no” to him on sticky legal issues. His critics, however, say Gonzales is far more likely to say “yes” – leaving the Justice Department vulnerable to a politically determined White House. “Do you recall a time when you (were) in there and said, ‘Mr. President, we can’t do this’?” Gonzales was asked. “Oh, yeah,” the attorney general responded. “Can you share it with us?” a reporter asked. An ever-growing cadre of critics says Gonzales has repeatedly sought to shape the normally independent Justice Department to the White House’s ends. The department has long resisted political influences that could threaten its ability to fairly and impartially uphold the law. -A dramatic 2004 confrontation between Gonzales, then serving as White House counsel, and former Attorney General John Ashcroft over whether to reauthorize a secret program to let the government spy on suspected terrorists without court approval. Ashcroft refused to sign off on the program. The next day, the White House reauthorized the program without the Justice Department’s approval. Ultimately, Bush ordered changes to the program to help the Justice Department defend its legality. Less than a year later, in February 2005, Gonzales took Ashcroft’s place as attorney general. The program was branded unconstitutional by a federal judge and has since been changed to require court approval before surveillance can be conducted. -Allegations that Monica Goodling, the Justice Department’s liaison to the White House and Gonzales’ former counsel, aimed to only hire career prosecutors who were Republicans. Making hiring decisions based on political affiliation is illegal. Goodling quit the Justice Department last month and is set to testify next week before a House panel investigating whether politics played a part in the firings last year of eight U.S. attorneys. -Justice Department documents show that shortly after the 2004 elections, Bush political adviser Karl Rove questioned whether all 93 of the nation’s top federal prosecutors should be ordered to resign. He also helped coach Justice aide William Moschella’s planned testimony before the House Judiciary Committee. Rove also was included in e-mail traffic about the firings between the White House and the Justice Department. As presidential appointees, U.S. attorneys serve at the president’s pleasure, and the White House is properly involved in discussions about their employment. But Rove used an unofficial e-mail address, registered to the Republican National Committee, to correspond about the firings – raising the specter that politics was behind the ousters. -The administration changed policy to allow more Justice Department officials to be in touch with the White House about some of the government’s most sensitive criminal and civil cases. During the tenure of Democrat Bill Clinton, such discussions were restricted to six people – two at Justice and four at the White House. In 2002, a year after Bush took office, the number of people was greatly expanded. By Sen. Sheldon Whitehouse’s estimates, 417 White House staff members and 42 Justice Department employees can discuss sensitive cases. “It creates a partisan atmosphere, and that creates issues of confidence in the administering of justice,” said Whitehouse, a Rhode Island Democrat who previously served as U.S. attorney there. Some Republicans, too, doubt Gonzales can keep the White House’s influence from improperly seeping into the Justice Department. “The problem here is that it appears the attorney general, when he moved from 1600 Pennsylvania Avenue to the Department of Justice, he didn’t realize he’d changed jobs,” said Arnold I. Burns, a deputy attorney general during the Reagan administration. Burns himself is a reminder that close ties between Justice and the White House have posed problems before. He resigned in 1988 in protest of charges of improper behavior by then-Attorney General Edwin Meese III, a longtime friend of President Reagan. Meese was later cleared but resigned before the end of the term. Former Attorney General Robert F. Kennedy, too, had obvious close ties to President John F. Kennedy, his brother. But critics say Gonzales’ relationship with Bush rivals that between former Attorney General John Mitchell and his former law partner, President Nixon. That ban was violated last year when New Mexico GOP Sen. Pete Domenici and Rep. Heather Wilson called former U.S. attorney David Iglesias in Albuquerque to ask about the status of public corruption cases. Iglesias later said they wanted to know whether he was going to indict Democrats before the looming election. The incident is cited by Democrats who argue the U.S. attorney firings were politically motivated. [Via NYTimes] Just as dogs preceded humans in making the first risky voyages into space, a new generation of canines has now made an equally path-breaking trip – from life to death and back again. In a series of experiments, doctors at the Safar Center for Resuscitation Research at the University of Pittsburgh managed to plunge several dogs into a state of total, clinical death before bringing them back to the land of the living. The feat, the researchers say, points the way toward a time when human beings will make a similar trip, not as a matter of ghoulish curiosity but as a means of preserving life in the face of otherwise fatal injuries. The method for making the trip is simple. The Safar Center team took the dogs, swiftly flushed their bodies of blood and replaced it with a relatively cool saline solution (approximately 45 to 50 degrees) laced with oxygen and glucose. The dogs quickly went into cardiac arrest, and with no demonstrable heartbeat or brain activity, clinically died. There the dogs remained in what Patrick Kochanek, the director of the Safar Center, and his colleagues prefer to call a state of suspended animation. After three full hours, the team reversed their steps, withdrawing the saline solution, reintroducing the blood and thereby warming the dogs back to life. In a flourish worthy of Mary Shelley, they jump-started their patients’ hearts with a gentle electric shock. While a small minority of the dogs suffered permanent damage, most did not, awakening in full command of their faculties. Of course, the experiments were conducted not to titillate fans of horror films but to save lives. Imagine a stabbing victim brought to the emergency room, his aorta ruptured, or a soldier mortally wounded, his organs ripped apart by shrapnel. Ordinarily, doctors cannot save such patients: they lose blood far more quickly than it can be replaced; moreover, the underlying trauma requires hours of painstaking repair. But imagine doctors buying time with the help of an infusion of an ice-cold solution, then parking their patients at death’s door while they repair and then revive them. Such a day may soon be at hand. Assuming the financing materializes, the Safar Center will coordinate human trials in the next two years (using patients who, after arriving at a trauma center, suffer cardiac arrest from massive blood loss). Risky? Yes. But as the dogs of the Safar Center can attest, far better to buy a round-trip than a one-way ticket when visiting the land of the dead. The Admiral won’t say, however — despite repeated questions during a Thursday conference call — exactly how much bandwidth the sites were absorbing before they were blocked. She notes only that they were these were the 11 Internet sites taking up the most network traffic on military networks. And that checking these sites for viruses and malware before they hit Defense Department computers was also a significant concern. Other sites — including popular blogging sites, like wordpress and blogspot — could be blocked in the future, if they appear to present network issues. [BBC] Romanian voters go to the polls on Saturday in a referendum that will decide the fate of the country’s suspended President, Traian Basescu. 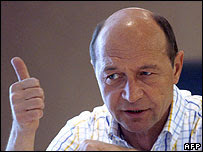 Mr Basescu was accused of violating the constitution and was suspended by parliament on 19 April. He has been locked in a long-running power struggle with his former ally, Prime Minister Calin Popescu Tariceanu. With a high turnout expected, Mr Basescu is tipped to win enough support to survive in office. It has been a bitter, polarising campaign in which appeals for civility and restraint have all but been ignored, says the BBC’s Razvan Scortea in Bucharest. The voters will have to decide whether President Basescu is a threat to democracy or a political hero pushing for renewal and good governance. On Friday, Romania’s Foreign Minister, Adrian Cioroianu, warned that Europe’s patience with Romania had a limit and that after the referendum, politicians should stop fighting and get back to work. Polls open at 0800 (0500 GMT) on Saturday and close at 2000, with results expected overnight. There are more 18 million eligible voters, including 2m Romanians living abroad. If a majority of those voting back the impeachment, then Mr Basescu will be removed from office. The opposition Social Democrats, who initiated the impeachment process, describe Mr Basescu as dictatorial and corrupt, a failure who has never lived up to his constitutional duties. The president claims that his enemies are desperate to stop his anti-corruption drive, which has rattled what he calls “the economic mafia”. The referendum will give the people’s verdict, but it may not end the crisis. If the president wins, he will still be facing his opponents in parliament, who also control the government, says our correspondent. The president has called for them to resign, but legally he cannot force them to go. If Mr Basescu loses, then new presidential elections have to be held within three months. However, the opposition parties appear to lack a strong candidate, so Mr Basescu could yet return as frontrunner. Some analysts say that only a general election could calm the situation, but the next poll is more than 18 months away.